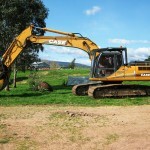 One of the best and reliable earthmoving contractors in Alexandra is Mansfield Plant Hire. This provider offer “wet” hire services which includes operator. Other services include dam construction and road building leading to your property. The company covers all areas around Alexandra in North East Victoria and can transport hired equipment anywhere in the area. For machinery hire, Mansfield Plant Hire can provide “wet” hire with operators or machinery only which is also called “dry” hire. For both types of hire, there are competent infield personnel to assist clients. All operators are duly licensed and are knowledgeable in government, forestry and farm related tasks. They not only have the capability to man the machineries but have solid experience to achieve the requirements of clients. 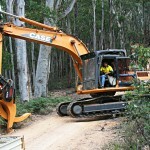 The equipment that Mansfield Plant Hire has can take on forestry work as well. If there is a need for clearing or fire breaks then this can be accommodated. This provider also has an excavator attachment, rippers, log forks and saws for tree mulching jobs. They have tipper trucks and trailers to take away tree trunks and rocks from the project site. The excavator attachments that the company has can well be one of the most complete. There are different sizes and shapes of buckets. This flexibility allows effective work on different types of excavation. Bulldozers have deep ripper attachments for work on compacted ground. All machines are equipped with accessories to handle any kind of job at any condition. Mansfield Plant Hire will always have safety as a prime concern. Safety for its personnel, client and the environment is assured of at all times. Clients are assured of implementation of safety standards for each and every project. All equipment hire are kept in the best running condition and undergo maintenance regularly to assure of optimum performance. With the best personnel, equipment and practices, Mansfield Plant Hire is surely one of the best earthmoving contractors in Alexandra.